Sizing and selection of explosion vent panels is critical to the safety of plant and personnel. Calculations are in accordance with general guidelines from standards such as NFPA-68 or VDI 3673. Baum Pneumatics CFD calculations on dust explosion can show the effectiveness of such calculations and provide alternative ways of achieving higher safety based on specific scenarios. Baum Pneumatics propitiatory CFD code solves explosion using input variables such as dust particle distribution, pressure, temperature and velocity values and solves the motion and chemistry equations for small time steps (1e-7 sec) and provides output at desired time intervals. The chemistry part of calculation is verified based on experimental values of dust explosion acquired from laboratory testing on given dust samples compliant to NFPA 69 and ASTM E1226 standards. The Kst and Pmax of the sample are 205 and 10.5 bar (as per NFPA guide the combustible dust for wood flour) respectively. An ignition source was placed at the center of cyclone which ignites the dust/air mixture at t=0 (sec). 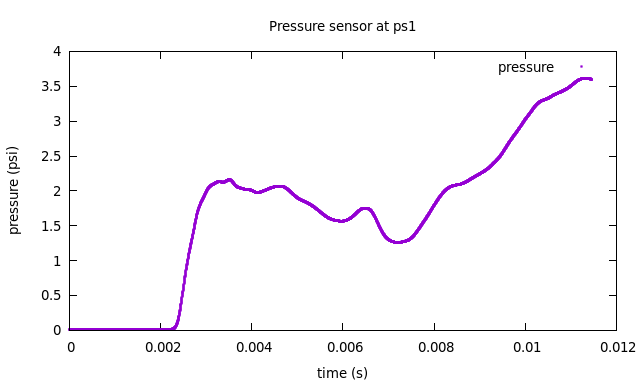 ps1 and ps2 represent pressure sensors located at the designed venting panels. Above plot shows pressure rise due to explosion on ps1 sensor up to t = 12 (ms) where venting area is open to atmosphere and flame can exit.